Rigging Perils for the New FF Owner…..!! First-Time Fifteeners – More on Twinning Lines….!! A few days back, as part of our series of posts for First-Time Fifteeners, we ran an item on the use of twinning lines. In most conditions running square, we actually spring the windward twinner approx. 2 feet from the cleat and set the leeward to match. The kite still flys balanced and square while remaining quite powerfull. The benefit is that gybing requires no movement of either twinner. While the crew smoothly gybes the pole, it is very easy for the helm to fly the kite (hopefully without collapsing, aided by the twinners controling both clews). This makes re-acting to windshifts and the presence of other boats a lot smoother and easier. Do you remember when twinning lines came in?? I just can’t figure out when it was…. In the sailing of my youth, the late sixties and seventies, I’m sure in GP14s, fireballs, ospreys, and flying dutchman, the most advanced thing we had was shroud or gunwhale hooks. They were the bee’s knee’s, they were. So I’m really not sure when twinning lines arrived as “de rigeur”. ( de rigeur : “necessary if you want to be fashionable, popular, socially acceptable etc”…)!!! Generally under sail, the lee twinner is loose and critically the windward twinner is down tight. With the associated turret cleat on the windward side this makes it a hundred times easier for the crew to control the pole. At the gybe, the lee twinner comes down just before going, to get it in position for the guy before we turn. In our boat, at sometime that the helm isn’t looking, the old windward twinner is flicked off. After the gybe, the pole is remounted and off you go. 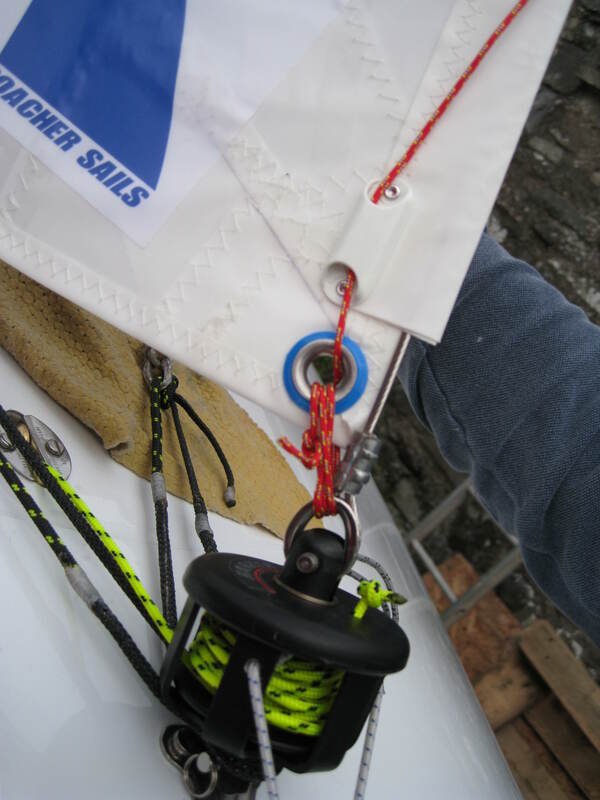 We have a bags boat, so when the spinnaker is down in the bag, you can tuck the halyard under the twinner and into the cleat to keep it parallel to the shroud and out of harm’s way. On the hoist, just before heaving on the halyard, that storage twinner needs to be flicked off – but then the halyard should leap out of the cleat and launch superbly. Now having said all that, is there anything else?? Well, yes…. In a blast of a breeze, when you are on a run the sail can make the boat unstable. If you are brave enough to still have your eyes open, you’ll see the spinnaker oscillating around pulling the top of the mast one way then the other. What you do the stablise the spinnaker is yank the lee twinner right down. This stablisies the sail a treat, and whoosh – off you go!! You might try also just slightly over sheeting and pulling the guy in slightly tighter if it is totally wild – then just hang on! There might just be one more thing too. On a dead run in light to medium airs, I sometimes can get the illusion that the boat goes quicker if the windward twinner is down to within maybe a couple of feet of the shroud. I’m not sure at all, but give it a try and see what you think. Someone will probably leave a “cobblers” message on the blog if I’m wrong, but they may do that if I’m right as well !! Getting Those Unused FF’s Back on the Water ….!! 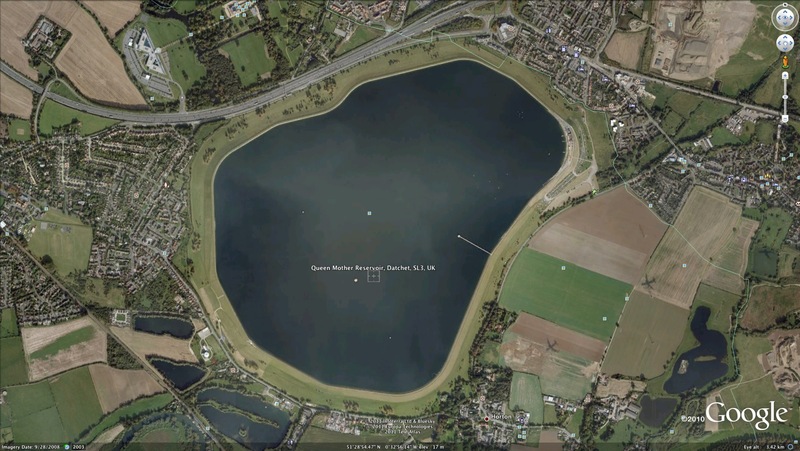 Do you have Silvers and Classics languishing in the boat park unused?? 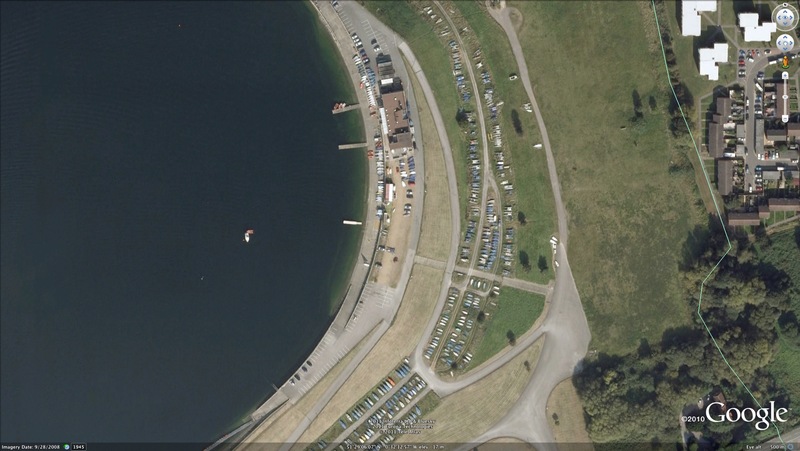 At Llangorse we are trying hard to get these boats back in use. 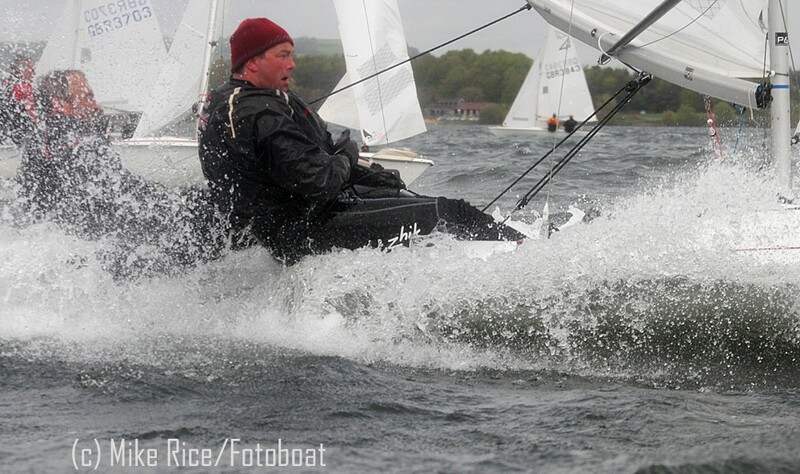 Yes we have a number of mainly silver boats that are not in any sort of racing trim. The owners are keen (sometimes)but do not want to spend a lot of money to start with. We have got them more interested by suggesting improvements that do not cost a great deal. Help set their boats up for them. The next step is we get some of the more experienced crews to go out with them. Suggesting improvements. From this we have generated more interest from those that did not initially get involved asking for help & advice. They then move on to better sails(Second hand of course) and better kit. My apologies if I am stating the obvious. This gives the slower Silvers more chance to get a better result. Yet More on the Jib Cunningham….!! Nice to see we seem to be doing something right!!! This posting made us think of that Jib Trimming book, which we did get and found quite instructive. One of the key points of that book is adjustment of the jib cunningham in real(ish) time as part of the sail trimming. So…. anyone got any bright ideas how to incorporate a jib cunningham adjustment into a Harken furler? That’s fine for getting 4″ distance accurate but not necessarily for achieving the correct tension, as this might end up at 3 1/2″ or 4 1/2″. My suggestion , (and it’s only a suggestion!) is set the 4″ as described above and then take the genoa down and rehoist it UPSIDE DOWN!! Stand around for a few moment whilst all the smart bottoms (there might be children reading this) come up to you, wetting themselves with the pleasure of being able to tell you what a plonker you are, only to have the wind taken out of their sails (pun definately intended) when you explain that quite obviously you are adjusting the tension of the luff using the lanyard at the top of the sail, thus retaining an accurate 4″ at the tack. Tape the lanyard up, as once set you shouldn’t need to do it again. But don’t forget to take the sail down again and rehoist or you really will look silly as you unfurl on the start line!! Do you ever do much with your jib cunningham?? Well, for a lot of us it’s all a bit of a fiddle and we leave it alone. But is it all that difficult?? First off, there is a requirement in the rules that you have at least 100mm between the tack and the deck. So you need a sense of where that measurement is. You are looking to have just enough tension in the cunningham that the wrinkles in the luff just about disappear. Then take that string – loop it three times between the halyard and the tack, then up through the little clamcleat there. 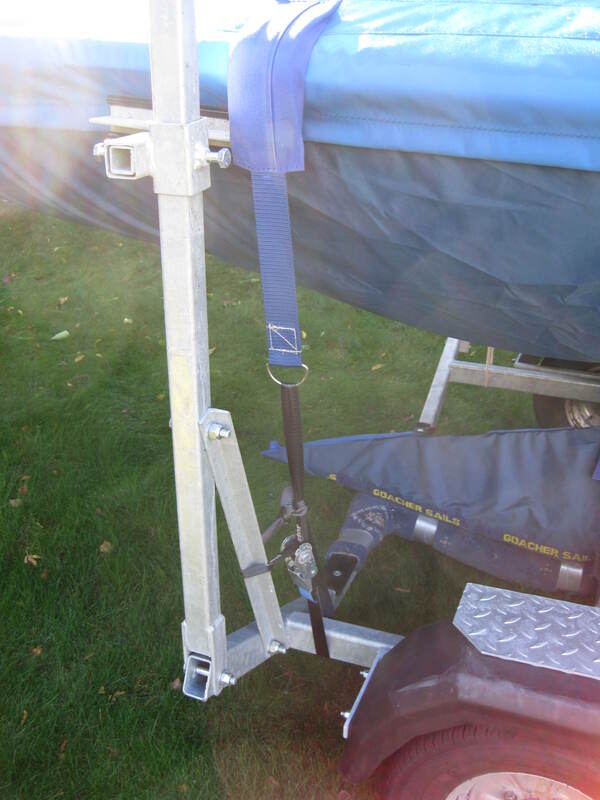 Just give it a good tug into the cleat – don’t put a security knot in it for fear of snagging a spinnaker sheet in it. Just leave the clean tail of the string. The example in the photo was done by a god…. First Flying Fifteen ? Towing It Home – Part 3…!! 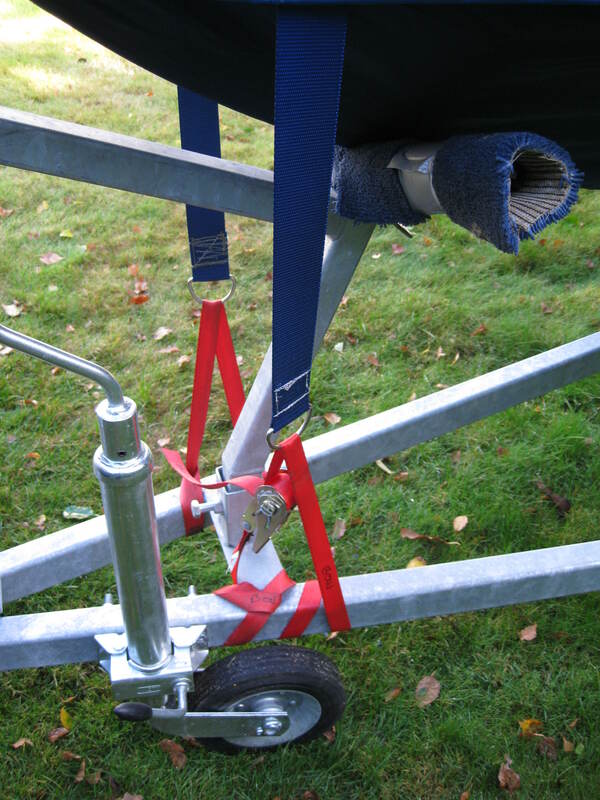 In the last two blog posts, we looked at securing the boat neatly to the trailer – what else is there to think about?? Mast and Light Board…. 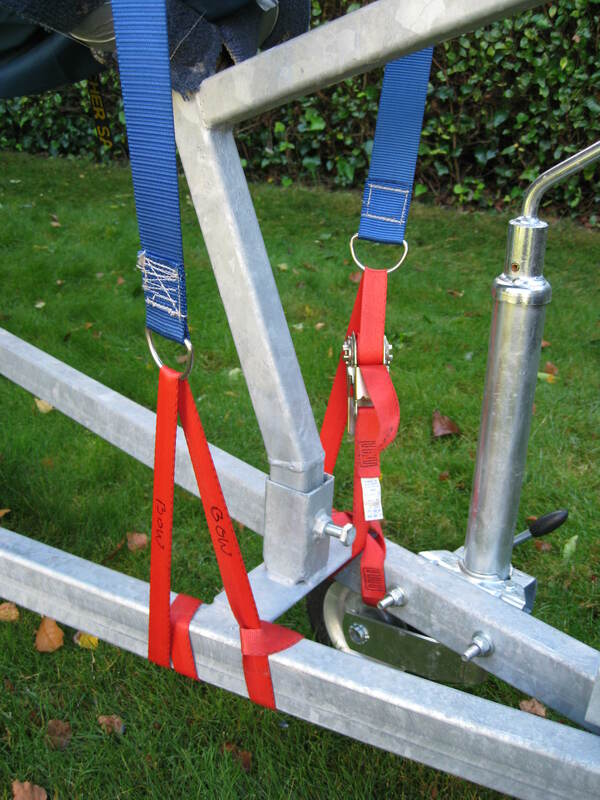 Mast first – there are a whole selection of mast mountings very often based upon a bridge in the centre of the boat, and the normal mast support at the front. For years we towed our boats like that, but with mast foot facing forwards, you do find that the rear end (top of the mast) whips around a lot over the bumps. The solution interestingly is to do with modern FF covers. They now have a loop at the back so can be supported by the two ends – thus reducing the whip problem. 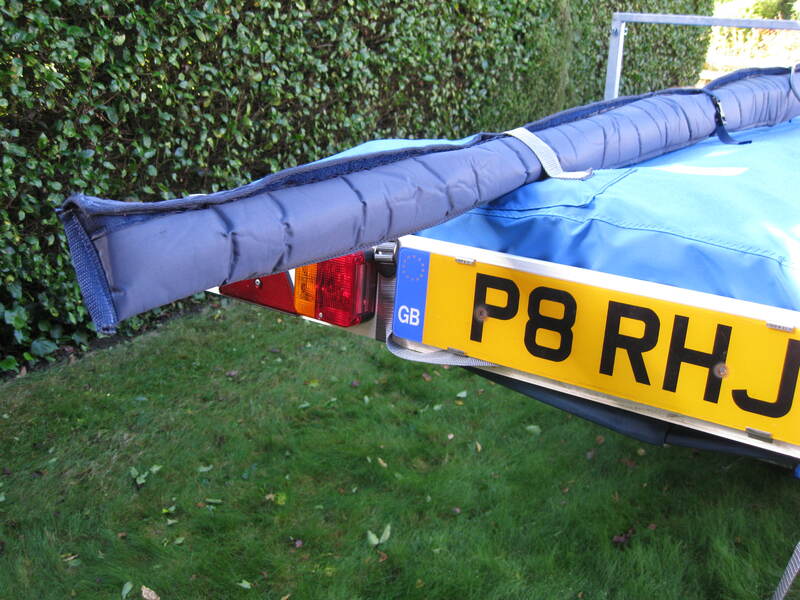 I have a car with a high roof (Land Rover speciality), so I need to have a bit of rear overhang. Remember that by law now the most this can be is one metre – you dont need that much on an FF, so you’ll be alright. 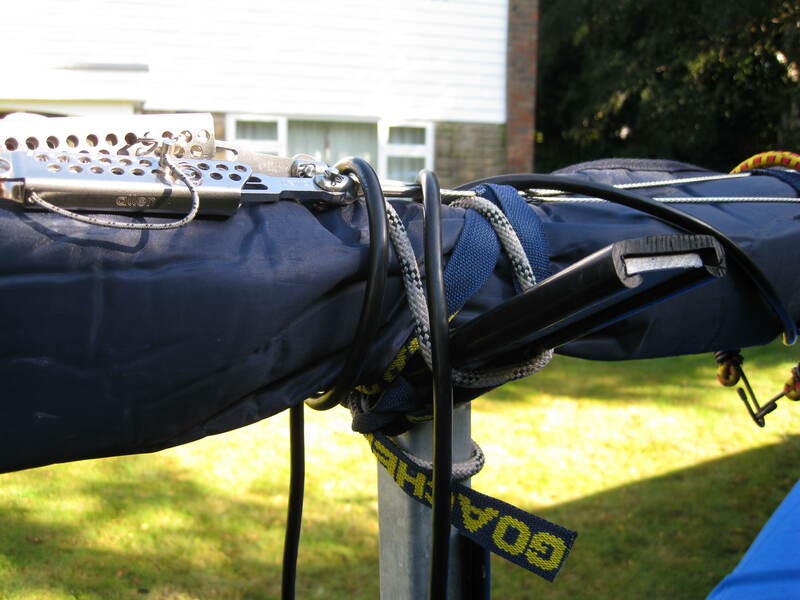 We often tie the mast centre to the cross-over strap if we have one to stablise the centre of the mast as well. Now what of the light board. Again the answer lies in the cover. For many years we all had a light board based on a GRP moulding of a transom which fitted it over the stern of the boat – only needing to be secured forward (somehow). I hated it and and have had two jump off – one near Northampton (God works in mysterious ways) and one towing to the Europeans at La Rochelle. “Never again”, I swore… I don’t have a photo of it – I gave the whole thing to Phil Tinsley …… who collects just anything for his personal FF Fleet. 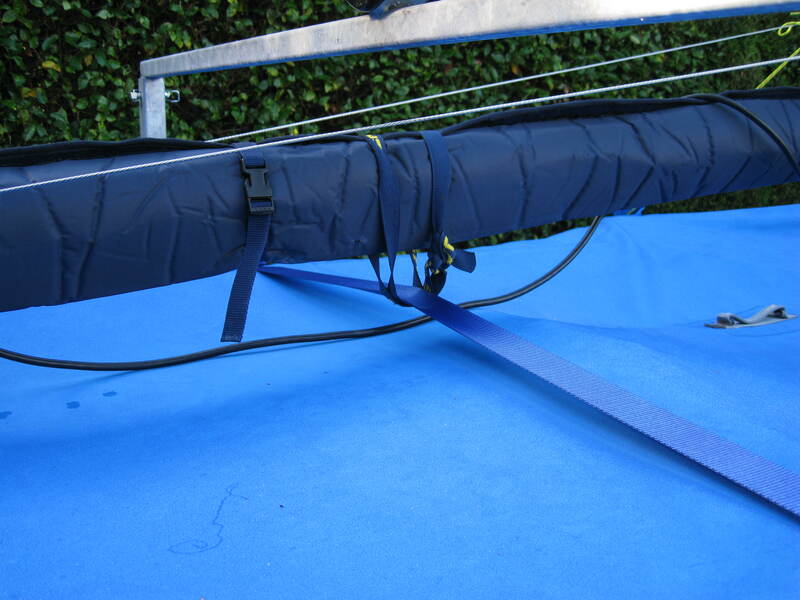 The answer on newer covers is to have two loops on the back upon which you can mount a standard light board. (see photo above) It works a treat as you can see in the photos. Go this way if you can. Yesterday we looked at securing the bow, now lets think about midships!! You will see boats with extra long straps over the top, securing the boat like a dinghy. You don’t want too much pressure in that – part of class folklore is that boats that do a lot of towing develop cracks along the gunwhale surface as this tie-down strap applies pressure at the edge of the boat, leveraging the overhang of the gunwhale design. What most people do instead, or sometimes as well as, is secure the main weight of the boat by the keel. 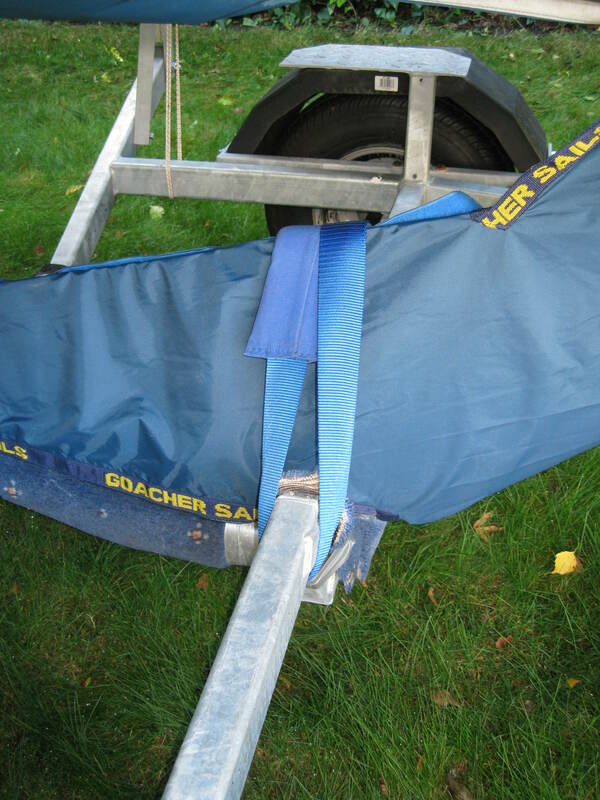 Hopefully, your kit of straps from your sailmaker includes an assymetrically padded strap that enables you to secure the keel very firmly to the trailer. The assymetric padding is to position over the top of the keel – which is very fine – to protect it. If you want to put the top strap over then, just thing of it as being there to stop the boat wobbling around. 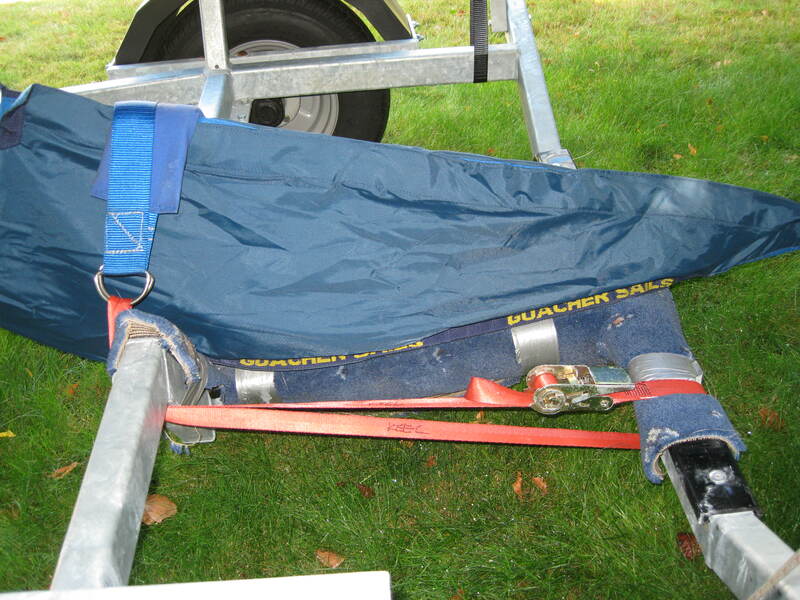 If you have a Hayling Trailer, you should move the side chocks in to achieve the same effect. With the keel firmly secured, the boat is not about to part company with the trailer in any event. So you have just bought your first flying fifteen and are thinking about the long tow homeward?? If you’ve only had dinghies before you might be tempted to make sure this heavy brute is well tied down. Actually, if you’ve only towed big boats before, you may think the same. So what do we do?? Well, lets deal with the basics. Ratchet straps are great, but you only need two, or three maximum. Straps, specially made for FF’s and available from sailmakers are a great idea too. We shall deal with the light board later, but lets figure out how the pro’s tie them down. First – the bow is dead easy, but you will either want to go through your mooring eye, or maybe have a little bit is string attaching the tie down strap to the mooring. Otherwise, the strap wriggles forward and slackens off as it goes – you don’t want that. We shall deal with the securing the boat at the wheel axles in the next blog post. Just started to crew a fifteen?? So what do you think of this jib trimming lark?? Pretty easy, huh?? Pull a bit, let a bit out, watching those woolly things, get shouted at a bit !!!! Well, actually, to my surprise a couple of christmases ago, I got given an entire book about jib trimming…. “Hah, who needs that? !”, I said !! Funny thing is it’s a pretty good read. It’s called “Jib Trimming – an illustrated guide” by Felix Marks. It’s only about 70 pages long and so only £6.99 on Amazon. Good present idea for your Bowman/Bowgirl?? If you look on Amazon, it’s got that way that you can read the first few pages as a sample. 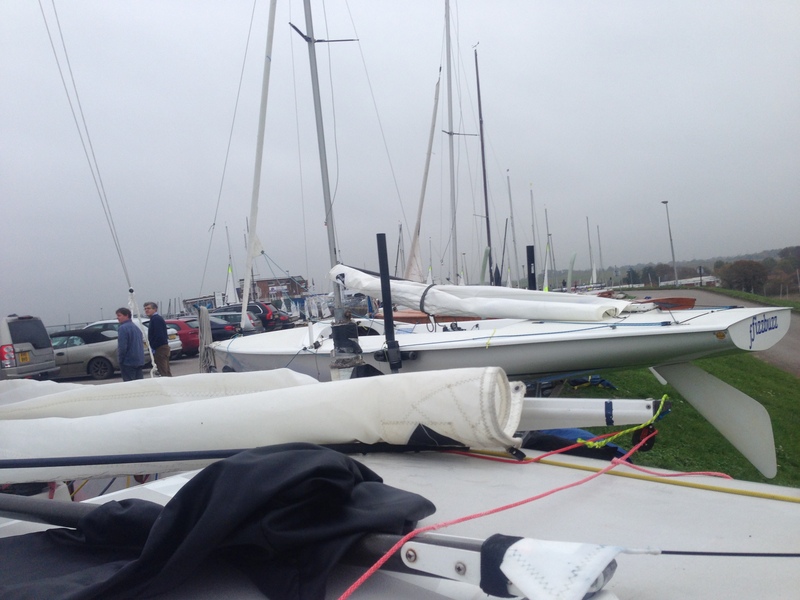 Small Jib for Lighter Teams…. I was chatting with Jeremy Davy recently, and we got to talking about the lack of progress with FFI on the new rig. The basic discussion was around how much easier the boat was to handle with the new jib especially. The Dragons recently approved an additional smaller jib to help lighter teams compete in a blow. 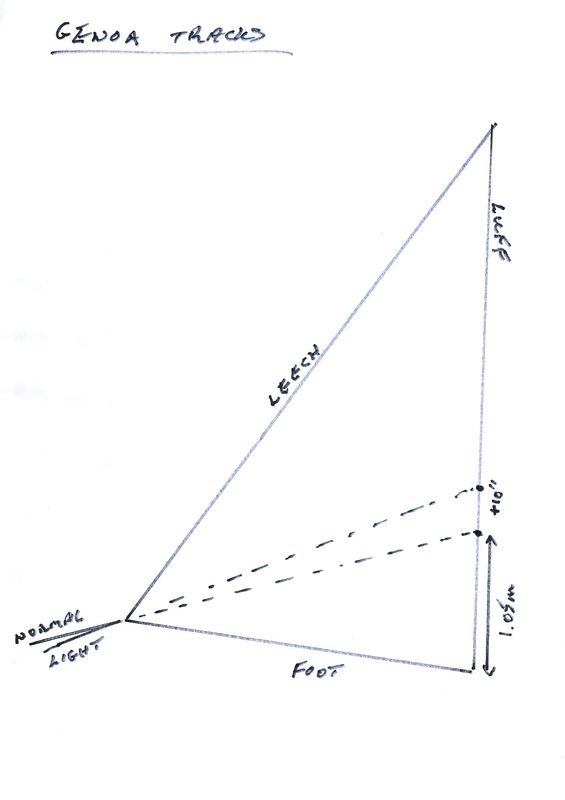 Jeremy pointed out that even if we don’t get the new rig, why not make the measurements on the existing genoa “maximum” measurements … then sailmakers could experiment with smaller sails to some extent within the existing measurements. Starting a Fleet at Burnham….!! The Royal Corinthian at Burnham is now promoting their Flying Fifteen trial sail day on its website!! It’s a lovely Club by the way!! Remember – if you can recommend it to a potential trialist in the area, or can help Justin out, it will be very much appreciated !! 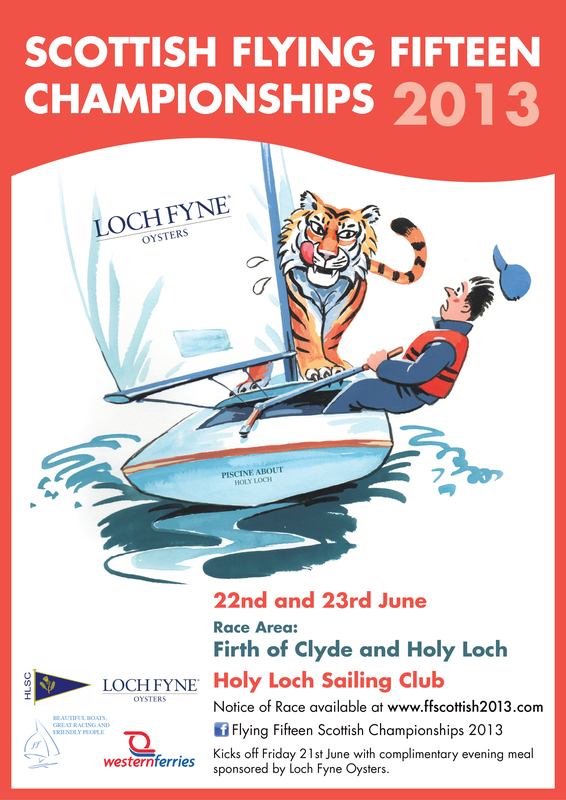 Try a Boat Free for a Year….. Regular FF Blog readers will know that the Datchet Fleet has had great success in growing the fleet by having a loan boat that people can try for 1-13 weeks. It’s a commendable idea that works and is really not that hard for most fleets to put together.